I had started my first day in Bangkok at the magnificent Grand Palace. Spectacular, yes, but it was also filled to capacity with tourists. Suffice to say, I was not unhappy to be back on the streets and heading for good fortune. The amulet market, that is. What’s not to love about a whole market selling lucky charms? Just around the corner from the palace, between Maharat Road and the river, is Talaad Phra Chan, a century-old market where thousands of Thai Buddhist religious amulets, charms, and talismans are sold. You’d think people would be clambering for good luck, but the sidewalks were surprisingly empty. One man was examining amulets with a magnifying glass, so he must have known what he was looking for. I just chose them based on designs I liked. At only about fifty cents for five (cheaper than a lottery ticket), I picked out a few for me, and then a few more for friends and family. Towards the end of the block, the amulet market morphed into the medicine market. I guess that makes sense…? Tables were filled with jars of potions, and bottles of powders, none of which made any sense to me. He laughed hysterically as I coughed and sputtered, eyes watering and throat burning. Then he explained that what was in the tiny plastic packets in the jar would cure anything. He gave me a handful of them, free of charge, and sent me on my way. It was time for another temple, so I jumped into a tuk tuk. A tuk tuk is a three-wheeled open vehicle, also known as an auto rickshaw. The name comes from the sound it makes. There are no meters, like there are in a taxi, so fares are negotiated in advance with the driver. Thai tuk tuk drivers are notorious for overcharging tourists, and I know I paid too much (100 baht / $3) but it was dirt cheap compared to a New York City taxi, and at the time I just wanted to get where I was going…if you’re not near the Skytrain or a boat, a tuk tuk is the fastest way to get around on the congested roads in Bangkok. They can, and do, weave through traffic like nobody’s business. Wat (“wat” means temple) Pho is known for being the first public university in Thailand, the home of over one thousand Buddha statues, and, drum roll please, the 150 foot long Reclining Buddha. Constructed in 1832, the massive gold-plated reclining statue was made to represent the passing of Buddha into Nirvana after death. The bottoms of his feet (ten feet high, sixteen feet long) are inlaid with intricate mother-of-pearl decoration, illustrating the 108 notable characteristics of Buddha. Along the wall behind the resting statue are 108 bronze bowls, to match the 108 attributes, into which coins are dropped, one by one for good fortune. That’s 108 possibilities for good karma to follow. After dropping all my coins in bowls (heck, I’ll take good fortune any way I can get it) I went into the garden outside to see a tree. It’s not just an ordinary tree, it’s sacred. It’s called a Bodhi tree, named for the celebrated tree in Bodh Gaya, India, under which Buddha sat on the night he attained enlightenment. The Bodhi tree has become a symbol of the Buddha’s presence and an object of worship for centuries. 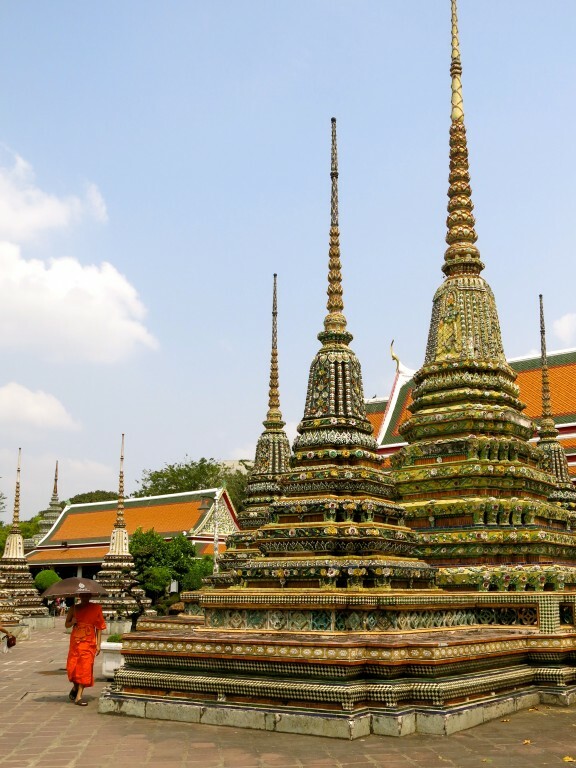 The tree at Wat Pho is a descendant of the original, and is therefore much revered. This little girl was paying her respects to the legendary tree. Among the Buddha images in Wat Pho is Phra Buddha Theva Patimakorn, which means “the Buddha built by heavenly beings.” This Buddha is so special that it has it’s own opulent temple. Also within the Wat Pho complex is a Royal Monastery, and the saffron-robed monks were a stark contrast to the tourists among them. I came across this scene that looked like monks sitting for an SAT test. I’m sure what they were being tested on was much loftier than a college entrance exam, but the animation on this sign seemed kind of funny for a monastery. On a green carpeted area, it appeared that elder monks were waiting to ordain the novices. In another part of the compound, there’s an elementary school. Just look at the sweet boys helping each other remove their shoes before they go into school. At this point in the afternoon, I was pretty sure I was going to die of heat stroke. The scorching sun was relentless. I could have fried an egg on my head. In spite of the discomfort, I had to check out the notorious palm-reading monks before I left. I love the looks on the faces of this family watching while one of them had his palm read. By the look on his face he was not getting good news. Look at the little boy in the baseball hat, checking out his own palm. Priceless. Wat Pho is also renowned for being the birthplace of Thai massage, and you can sign up for authentic massages at the school. In theory it was tempting, but in reality I was so hot and sweaty, the last thing I wanted was someone touching me. This is where I was dropped off. Don’t worry, though, because this was across the street. There it was…the shiny, fashionable, electronically-chilled, Siam Paragon Mall. I bought myself a blueberry frozen yogurt pop and window-shopped, while enjoying the oh so cool air. I hopped on, and rode back to my little neighborhood of Phloen Chit. …and a man on a motorcycle with a big bouquet of red roses. Finally, I reached my own (albeit temporary) nirvana, my hotel, Ariyasomvilla. Jet lag and the heat of the day had done me in, and I was ready to recline like a buddha. Feeling lucky to be in Thailand (and I don’t need an amulet for that) I crawled into bed and closed my eyes. Check back for more details and quirky stories about Bangkok, including selfie madness at the Grand Palace, and the peculiar signs I found all over the temples. Subscribe if you don’t want to miss anything! I always think of Murray Head’s song “One Night in Bangkok” (will make a hard man humble…), but your pictures make Bangkok seem quite beautiful and relaxing. Such beautiful pictures and the colors of everything is also breathtaking. Thanx for pix. Thanks Pam—-I feel as though I’d been there, and didn’t have to be subjected to the heat! Wonderful descriptions. Anxious to read more. ← Previous Post: Who is Buddha anyway?